(Sunday night) Why can’t I write this? I had a good time, saw some fun sights, ate some good food. The words just aren’t coming. 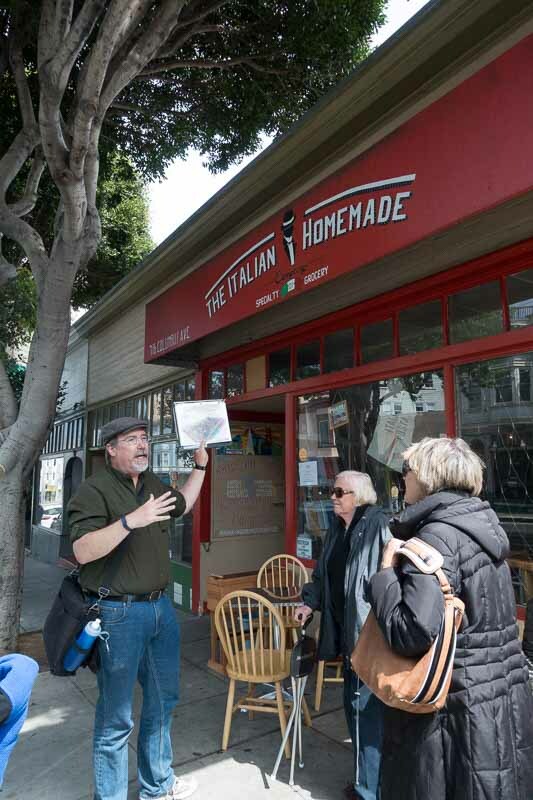 Bob Munson wangled a free walking tour of North Beach/Little Italy last week. 15 of us had a great time on Saturday afternoon, stopping in at a half dozen cool eateries to sample the wares while learning a bit of history. The tour was provided by Taste Bud tours, a company which leads this sort of tour in a number of major cities–which is how Bob found them when Nancy Munson and Sheryl Nagy took a tour of New Orleans during the nationals. Bob told them he knows a famous blogger, and we all got a freebie. I guess they hope I’ll write something nice about the tour. I think I probably will. As San Francisco grew during and after the gold rush, the area from Fisherman’s Wharf up the hills towards Broadway and Columbus was populated by Italian immigrants, who made up the bulk of the fishing fleet. After you crossed Broadway, it became Chinatown. Our group met at The Italian Homemade Company, on Columbus Avenue. We were called to order by our guide, Jim. A tall bearded man with a gentle air, he clearly knew his business and took charge easily and smoothly. Italian Homemade is a relatively new establishment, run by recent immigrants from Italy. They make fresh pastas and sauces, to eat in or take out. The counter and food case. Light delicate pasta, a perfect blending of the sauce and the cheese, this is the lasagna I’ve been looking for all my life. (Tuesday afternoon) After they dragged me out, kicking and screaming, we took the short stroll down the street to XOX Truffles. The owner, Jean-Marc Gorce, started out as a chef at Fringale, but the pressure got to his heart, so he took the low pressure route of opening his own store, where he manufactures phenomenal truffles for both the retail and wholesale markets. Jean Marc came out of the kitchen to tell us about his life and his truffles, then he made some for us to taste. The store is tiny, and we all had crowd in tightly. Then some big guy had to barge his way to the front to take pictures. The truffles are tiny globs of something wonderful, enrobed in chocolate ganache and then rolled in cocoa powder, ground nuts, or whatever else strikes the chocolatier’s fancy. XOX makes over 30 different varieties. The final coating of cocoa powder. Everyone got a couple of truffles, and many an addiction was begun. Suitably sated with chocolate, our group meandered up the street to Washington Square for some more talk about the history of the area. I think Jim needs to study a bit more about the history of Telegraph Hill; it was not the site of the first telegraph in the city. Nonetheless, it was a lovely, perfect day in the City, a rare gift for all of us suburbanites. Al Fresco education in Washington Square. Next stop was Tony’s Pizza Napoletana, a North Beach landmark for ages. Tony is a bit of a fanatic–when he goes to the big pizza competition in Italy, he ships his own coal fired brick oven. On the other hand, since he’s won the world championship more than once so I guess he knows what he is doing. Tony’s Pizza, right on the square. I have a conflict of interest in talking about somebody else’s pizza–I think Fat Slice is the best around. That said, this was interesting because they use a very good pepperoni, albeit not much much of it. The crust is thinner and limper than I like, but the sauce is very good and I guess it’s a good slice of pizza if you don’t happen to own a pizza store of your own. Crossing Columbus Avenue, we walked over to the parking garage behind the police station, passing the house where Joe DiMaggio was born before his family moved to Martinez. There are benches outside the police station where very elderly Chinese while away the hours in safety. The parking garage across the street is adorned with photos of local people who paid to be immortalized in exchange for funding the building. Our purpose here was to go to the roof of the the parking structure and enjoy the best view in North Beach. Next stop, Cafe Greco for tiramisu. A great place to sit and pass the time of day. Didn’t I see this in Knoxville last month? The car is advertising for the restaurant, and whatever palms are necessary have been properly greased so they car just stays in the loading zone. That’s life in the big city. The Mona Lisa is the last stop on the tour. We sank into our chairs at a table for 16, and they fed us a lovely dish of gnocchi tricolore, potato dumplings with 3 sauces. Pesto, bolognese and alfredo sauces, the colors of the Italian flag. The tour ends right there–you can stay and eat as long as you want to. Our guide said goodbye and urged us all to write glowing reviews on Trip Advisor. The day was a success as far as I’m concerned. All of us had a good time, enjoyed the food and learned a bit about the history of North Beach. The total walk was less than a mile, nothing too strenuous or difficult. The pace was pleasant, not the least bit rushed. We never felt like a squad of Japanese tourists madly following a guide through the Louve. Taste Bud Tours did a professional job, including recommending a reasonable place to park in the crowded and expensive city. Our guide was clearly experienced, knowledgeable, friendly, affable, avuncular and prepared for all circumstances. He herded our group of cats expertly and joyfully. Looks like the company is going to get the good write-up they wanted after all. Great report — very informative.